On August 22, 2012, the U.S. Securities and Exchange Commission (“SEC”) adopted final rules to implement reporting and disclosure requirements related to “conflict minerals,” as directed by the Dodd-Frank Wall Street Reform and Consumer Protection Act of 2010. The rules require manufacturers who file certain reports with the SEC to disclose whether the products they manufacture or contract to manufacture contain “conflict minerals” that are “necessary to the functionality or production” of those products (ex. stainless steel may contain very small traces of conflict minerals that are inherently present or have been intentionally added). 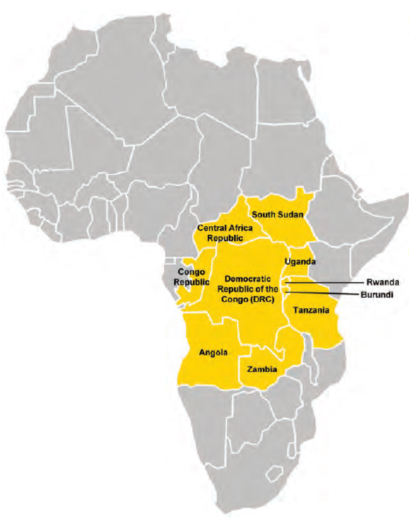 Conflict minerals include: cassiterite (tin), gold, columbite-tantalite (tantalum), wolframite (tungsten), their derivatives and other minerals as determined by the Secretary of State to be financing conflict in the Democratic Republic of the Congo (DRC) and the surrounding nine covered countries (see map). If you need to learn more about the subject of conflict minerals, you can review the SEC's Final Rule. In order to comply with our customers’ reporting requirements with respect to this law, Conax Technologies requires our suppliers to complete and return the Conflict Minerals Reporting Form. This template is a version of an industry approach (EICC GeSI Conflict Minerals Reporting Template) for the collection of sourcing information related to conflict minerals. In the event that Conax Technologies becomes aware of any DRC conflict minerals within the materials we purchase from certain suppliers, Conax Technologies will seek sources of supply that provide materials free of conflict minerals. Conax Technologies will continue to evaluate this situation as legislation unfolds that clarifies the DRC conflict mineral reporting and usage requirements for our company and for our customers. We are committed to ensuring that the products and materials we supply to our customers are in compliance with this requirement. For more information on this situation, please contact your Conax Technologies salesperson or Ellyn Schmitt, our purchasing department Conflict Materials Coordinator. According to the SEC, the Covered Countries account for 15% to 20% of the world’s supply of tantalum and smaller percentages of the other three minerals.